Melbourne (AFP) – Ruthless Caroline Wozniacki kicked into full gear Sunday to storm into the Australian Open quarter-finals with workmanlike Marin Cilic joining her after winning his 100th Grand Slam match. On an overcast and muggy day at Melbourne Park, the world number two Dane turned on the style to take another step towards a maiden Grand Slam title. 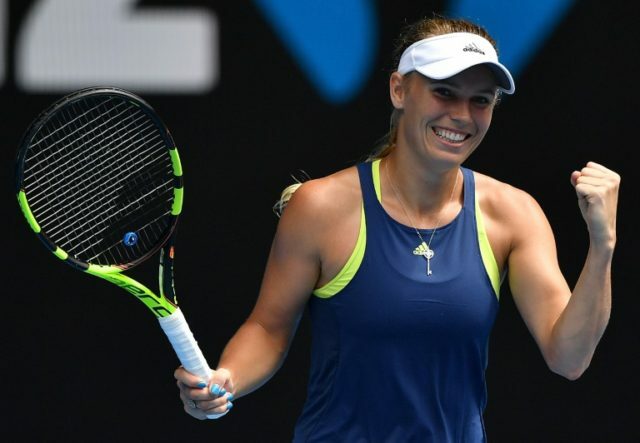 The assured Wozniacki, a semi-finalist in 2011 who has never quite lived up to the hype in the majors, annihilated 19th-seeded Magdalena Rybarikova 6-3, 6-0 on Rod Laver Arena in her most impressive performance to date. Her easy passage sets up a last-eight clash with gritty Spaniard Carla Suarez Navarro, who battled back from a set and 4-1 down to shatter the hopes of 32nd seed Anett Kontaviet. The Estonian had been bubbling with confidence after despatching French Open champion Jelena Ostapenko in the third round, but nerves got the better of her. The 37th ranked Elise Mertens also made the last eight, becoming the first Belgian since Kim Clijsters in 2012 to get so far in Australia. She posted a straight sets win over Croat Petra Martic 7-6 (7/4), 7-5 and will now play either fourth seed Elina Svitolina or Czech qualifier Denisa Allertova. Mertens is a form player after winning the lead-up Hobart International, while Svitolina was the champion in Brisbane. Former US Open champion Cilic mastered Spain’s 10th seed Pablo Carreno Busta in four sets to reach the last eight in Melbourne for the second time. The sixth seeded Croat was the better of the two in the long rallies to win 6-7 (2/7), 6-3, 7-6 (7/0), 7-6 (7/3) and set up a clash with either world number one Rafael Nadal or Argentina’s Diego Schwartzman on Tuesday. “It was a big battle and I am really relieved that I played such a great tiebreaker at the end,” said Cilic. Top seed said Nadal is gunning to make the last eight for the 10th time. Ordinarily he would have top billing on Rod Laver in the evening, but not with local star Nick Kyrgios in action. The maturing Australian 22-year-old dispatched French veteran Jo-Wilfried Tsonga in the last round and now faces third seed Dimitrov.